Kashmir has been a very subtle reminder that poetry needn’t reside in pages and words alone. Where the ink has faded and the pages have turned yellow. It is a living, breathing form with a pulse that you can feel, a heartbeat that you can hear and an expression that you can embody. In heartbreaks and in love, in tears and smiles, in despair and hope, in tragedy and joy, in every nook and corner, every street, brick and bread, and leaf and ripple, Kashmir is poetry brought to life. And just like in the best of poems, Kashmir is where the highest form of happiness meets the deepest sorrow. But the ink is still wet, the verses still being penned. Kashmir isn’t one of those places where you can just rush through and profess you’re an expert. The real Kashmir isn’t in the regular tourist circuit, there is much to discover and learn. You need to stay here at leisure to experience Kashmir in its entirety; in its multi-cultures, cuisines, people and stories. I am no expert either; this is only my first tryst with this heavenly state. However, I’ll try and do justice to whatever number of days I was here. I am travelling with my family – Mom and Dad. They were here back in the year 1985 and have only praises to sing of Kashmir’s eternal beauty. It is essentially Dad’s plan that we travel across Kashmir for the length of an entire week. He loves it. And Mom has, time and again made it clear, “Kashmir ke aage, mujhe koi pahaad pahaad nahi lagte.” which means every other beauty simply fades in comparison when one sees just how beautiful Kashmir is. A reference to a few times we’ve been to Uttarakhand together in the last year or so, and my repeated escapades to the state I’ve so come to love. I remain a sceptic. We shall see, I tell myself. We get off at the Srinagar Airport and board a taxi to the heart of the city. The streets are eerily empty and the shops closed. It seems like a ghost town. It is the day after Eid and the celebrations here go on for days, says our driver, Ahmed. “Abhi sab log aap ko udhar he milenge. Sab families” He adds. I’ll find the entire crowd where we’re heading, all the families. 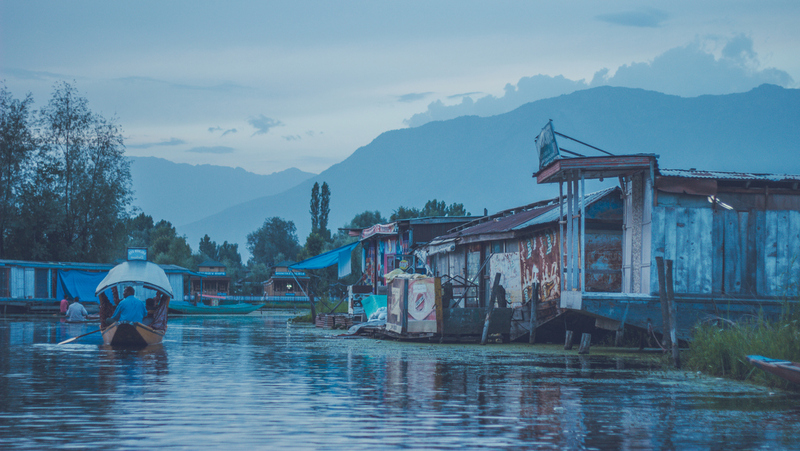 We cross Lal Chowk, now making our way to the Jewel of Srinagar – Dal Lake, where we’ve made reservations for the night in a traditional houseboat. The Boulevard Road is packed with cars and people but thankfully this is where we exchange goodbyes and Eid wishes with Ahmed and hop onto a Shikara that will take us to our houseboat. There’s much needed respite from the heat. The breeze is gentle. Just 5 minutes of rowing across the waters, amidst houseboats and a few homes, and I’m sold, lulled into silence listening to the sound of the oars, watching all the fanfare from afar. The gorgeous Zabarwan mountain range towering over this ethereal water body, a few distant Shikaras and voices in local dialect and I’m sold. This is outrageously beautiful. Adding to the visceral is the smiling, welcoming faces of our hosts, Bilal and Danish of the Altaf Houseboat. The sceptic in me died a little, much to my pleasure. This feels like home. But there’s much left to explore. Let’s row across the clouded skies and look upon the seven heavens in the waters. Much of the afternoon is happily spent in conversations with the hosts over Kehwa, waiting for the sun to go low before we hop onto the Shikara. It is time; we set out for the evening. Farrukh bhai is our oarsman, and guide, full of stories and anecdotes. There are Shikaras all around, families and some lone travellers, locals and tourists. Festivities are in the air. The sun is about to set, the waters don on a golden hue. Magical! There are a few wandering vegetables and flowers seller, rowing about casually. And a few traditional attire and jewellery sellers, playfully asking people to buy a souvenir or two. Even helping some put it on by hopping onto their boats. This is the heart of Kashmir. And it’s beating. Happiness and smiles is the only thing I see. Or I choose to see. From Golden Lake to Nehru Park to Open Lake and then tardily rowing through the backwaters, Farrukh takes us places. The sun is set. Whatever light remains makes the surroundings come alive with a bluish tint that looks all the more otherworldly. The reflection of the artificial lights from the local arts and crafts shops nearby further elevates the proceedings. Mom buys a suit for a reasonable price. I click a few pictures in the meanwhile. We’re now heading back, and take a few minutes to be in sync with the nightlife at the Dal, silent and unrushed. As Farrukh drops us at our houseboat, I throw in a quick question that has been bothering me. “Once I asked someone not to do that.” says Farrukh. “Kashmir tumhare baap ka nahi hai. Ye humara hai.” was the reply he got. Kashmir isn’t your ancestral property. It belongs to us. “Kashmir hum sab ka hai.” he ends. Kashmir belongs to all of us. Gulmarg maybe India’s favourite Ski Destination but from the pictures I’ve seen, of both summer greens and winter whites, it has always struck me as the kind of place where I can just make myself at home without doing much through the day except aimless walks. And that is exactly how it felt like. Well, most of it. We set out from Srinagar at around 10 in the morning, from where it is less than a two-hour drive. A drive made even more beautiful by the Apharwat peak that doesn’t leave your sight for entirety of the journey. It is almost always snow-clad. We reach around 12 but following some confusion, are unable to find our home for the night – Gulmarg Meadows. A beautiful property of neatly lined up Swiss Cottages in the Strawberry Valley, merely a kilometre from the city centre. You will not find a better view from any accommodation here in Gulmarg. You can take my word for it. It is already 1 in the afternoon. The clouds are looming large and the famous Gondola’s (cable car) ticket counters close at around 3. Making matters worse is the fact that the Gondola from the base to the Phase I (Kongdoor Station) is non-operational due to a technical fault. It’s been 2 months, we’re told. We can get one from Phase I to Phase II (Apharwat Station). Left with no other choice and hoping that the rain will stay away, I broke my rule of never getting on a horse. Knowing well enough that even at my speed, I won’t be able to trek down from Phase I to the base before dark. So I got on one. A comfortable ride uphill and then it started raining. Somehow we reached the ticket counter on time but alas, most of the tickets were being sold to the horse riders who clearly had a deal with the tourists of ensuring they get a few. It was maddening, the crowd and the situation. And then the counters close. A little disappointed and shivering in the cold, we decide to come down. Kudos to the handlers of our horses who never let them slip where others were falling down like a pack of cards at every other turn because of the havoc the rain had made. I decide to spend the rest of the evening strolling around the lush green meadows doing absolutely nothing. Except eating some of the fluffiest, tastiest pakoras we’ve ever seen or eaten and clicking a few pictures. The unparalleled views of the meadows dotted with pines, far-off cottages, off-the-beaten tracks and the Apharwat peak have me hooked for good. This is undoubtedly one of the most picturesque scenes I’ve ever seen. It’s true what they say, “Kashmir nahi dekha to kya dekha.” You haven’t seen anything if you haven’t seen Kashmir. And if you ever decide to visit Gulmarg during the month of May or June, add another day to your itinerary for Gulmarg and spend it away from the daunting Gondola crowds and the menacing horse rides. You will not be disappointed. Because the beauty you seek is right there, all around you! If a valley could speak. Hold back your breath, y’all. It’s time, let the curtains fall. Moon is nigh, the sun is spent. Say, good night, creatures, big and small. It is a pleasant, three-hour drive from Gulmarg to Pahalgam, with bulk of the journey covered on the open national highway. A few kilometres after Anantnag, the geography starts to change towards the dramatic. Mountains come into the frame, green as ever. River Lidder is heard through the windows. There’s just something about the sound of a gushing river that calms your senses. It is also called the Lidder Valley, says Ahmed. Nearing Pahalgam, he shows us a few points where some of the most famous Hindi films have been filmed, including Bhajrangi Bhaijaan. Lidder keeps us company throughout. We cross the city centre and head towards the loved Golf Course, away from its bustle. Hotel White House is our home for two days – a beautiful little property with a lawn that overlooks River Lidder. We have two days and I want to absorb the sound of it as much as I can. The remainder of the day is spent at leisure. A few casual walks near the Golf Course and further into the village notwithstanding. Sleeping with the sound of the river constantly in your ears has its pros and cons. Pros being, you sleep peacefully through the night. And Cons, you sleep as if dead. It is morning already. A drive to Aru Valley, a slightly lesser-known valley upstream from the Lidder but no less exceptional in beauty, and the famous Betaab Valley, is the order of the day. The latter is named so after the film Betaab, which marked the debut of actor Sunny Deol and Amrita Singh. It was filmed here. On the way, the driver mentions some of the treks that start from Aru Valley. I am intrigued; I’ve long been planning to trek those circuits. Someday soon! After spending an hour at Aru Valley, refusing relentless offers to go for a horse ride, we head towards Betaab, where the rain, again, leaves us looking for cover. After strolling through the Betaab Valley Park, amidst pristine surrounding and river streams, and as always, greenery, we leave for Pahalgam to laze around the rest of the day. But not before having a lip-smacking lunch at Dana Pani, a vegetarian restaurant in Pahalgam, run by a local Sikh family. It is easy to see why Pahalgam has long been an all-time favourite among tourists and filmmakers. Lush with grass and trees, and a landscape made even more stunning by the River Lidder, stray horses and of course, sheep, Pahalgam has seen footfalls in the most troubled times. Most of it has to do with the fact that it is the first base for the Pilgrims undertaking the revered Amarnath Yatra. Chandanwari is just a handful of kilometres from here, the starting point of the trek. Landscape on the way to Aru Valley. Just when you think Kashmir can’t get any greener, it does. And dreamier! Sonamarg, in English which translates to ‘Golden Meadow’, takes its name from the yellow crocus flowers that grow on the slopes of the valley during summer. Snow-clad peaks and the Thajiwas Glacier take over the skyline with equal doses of might and grace, while the River Sindh gushes below. It’s the stuff finest dreams are made of. And it lives up to its reputation. But then it is also the last major halt for our troops heading to Kargil and beyond, for thousands riding to Ladakh during the summer, and for the Pilgrims set to visit the Amarnath Cave. Zozila (one of the highest motorable passes in the world) that connects Kashmir to Ladakh is in the vicinity. Taxies and supply trucks mar the beauty a little, emanating black fumes and noise. It’s only for a few months. Sonamarg lies covered under a thick blanket of snow during winter. Tranquillity can be found still, in its vast meadows, rolling hills and strolling horses. A four-hour drive from Pahalgam brings us to Sonamarg. And looking at its geography, I cannot help but feel surprised at how Kashmir continues to elevate its beauty at every one of these junctions and throw new surprises. Our hotel, Barzman, is a kilometre before the city centre. So naturally, away from the bustle, offering splendid views of the mountains, the meadows and the river, all at once. It is already 3 in the day and I am feeling a bit under the weather so I decide to sleep it off till evening. And then I head out to make some enquiries about our next day and just walk about, get the feel of the place. It is clouded and looks like it will rain cats and dogs. It does. But it stops awfully quickly. “Bombay ke fashion aur Kashmir ke mausam pe bharosa nai kar sakte.” I’m told. The fashion in Bombay and the weather in Kashmir changes in a matter of minutes. That’s reassuring, I think to myself. We decide to leave early the next day for the popular Thajiwas Glacier, expecting bright sunshine. But it is not to be. It’s raining. But we have ample time, rain jackets and proper shoes. I can easily walk it off, just as I love. While Mom and Dad get on the horses, I follow on foot eagerly. It’s not a difficult trail to follow or walk on. We reach the base camp, from where the horseman says he’ll not go any further while other horses carrying people continue to go uphill, in less than an hour. A little foul play notwithstanding, it’s a beautiful, expansive countryside, lush green with distant snows. There are also so many little rivulets and streams on the way because it’s almost always raining. While Mom decided to wait under the shed of one of the few food stalls, Dad and I decided to do it on foot. It took us a little under one hour to reach the place of eternal snows. The pebbled path cannot be missed and is easy to tread. If you’re there and it rains, walk alongside the trail, on the grass to avoid slipping, just as we did. It gets too slithery. After spending a good amount of time up top, again, refusing relentless offers to indulge in a bit of snow sledding, we come back to the base camp and head towards to Sonamarg. It is still raining. The horses are slipping. So are people. I cannot recall doing this level of mud-skiing ever before. It’s a dangerous proposition to go horseback riding when it rains. In times like these, I prefer to trust my own feet for balance. Nonetheless, it is a trek, or ride, depending on how you like it, worth taking. We spend rest of the evening lazing around, wandering about and catching up a bit on the FIFA World Cup. As a lonesome Shikara casually rowed in the same frame as the revered Hazratbal Mosque, I could feel it. In that fleeting moment, I could feel the pulse of Kashmir. From the Land of Golden Meadows to the City of Golden Hearts, time flies by. The drive from Sonamarg to Srinagar is a breeze. It is our last day in Kashmir. We visit the many gardens Srinagar is famous for – Shalimar Bagh, Nishat Bagh, Chashme Shahi and the Botanical Garden. The Tulip Garden is closed, much to our disappointment. There are no Tulips this time of the year, says Ahmed. They only blossom during the months of March and April. I find all of them equally beautiful and well looked after. But it is the view ‘from’ Chashme Shahi that wins me over – Hazratbal Mosque standing out, small but prominent, amidst the channels of Dal and pines, with the Zabarwan Range rising like a sentinel in the background. ‘Achingly beautiful’, I understand the connotation, maybe for the first time, in its depth. I wonder if it would have had the same impact if we didn’t know what we know about Kashmir. Maybe then it would just be ‘Beautiful’. Hazratbal Mosque as seen from Chashme Shahi. Registering those sights and sounds to my heart’s content, we move on. Shankaracharya Temple is just a few kilometres from here. No phones, metal or leather items are allowed beyond the last barricade. The security is tight. I decide to wait it out in the car while my parents go and pay their respect. They boast about the unparalleled views of Srinagar from up above. I want to see it too. And I do; it is something else. Never have I been left speechless by a view that didn’t have one of the prominent peaks of the Himalaya. This one did it though, at first sight. And it will remain etched deep into my conscience for a long, long time. Standing on the Shankaracharya Hill, a few kilometres before the temple, listening to the Azaan echoing from the valley below, and the life at Dal Lake dripped in gloomy evening colours, just like looking at a handmade model of a city that is not static but living, breathing. An expansive view of Srinagar from Shankaracharya Hill. It is night. We’re at a hotel at the Boulevard Road and have just watched a stunning sunset over Dal an hour or so ago. We have a flight to catch the next morning. Saying goodbye to a place you’ve come to admire in a short span of time is hard. But it is about to be made harder still. I decide to go out one last time, wandering the streets, looking for something I can take back home. Not necessarily a souvenir or thing. Something! There are people hanging out by the lake. Laughing, talking, having a good time. It is 10 in the night. A few shops are still open. They look even more beautiful at night. People are as welcoming as they can be. A few introductions and conversations later I come back, mesmerised by the warm-heartedness. The Gatekeeper of our Hotel strikes up a conversation. “Kashmir aaj he aaye ho?” he asks. Is it your first day in Kashmir? “No, no. It’s been seven days. We’ve been in Gulmarg, Pahalgam and Sonamarg the days before.” I tell him. He smiles. He looks like he’s 70-75 and has been here a long time. “Acha. Kaisa laga Kashmir?” he asks again, with a smile. How did you find Kashmir? “I haven’t seen a place as beautiful as this. And people.” I tell him, reciprocating with a smile. “Wapas aana chahoge?” he asks. Will you want to come back? There’s a sense of concern in his tone, but also hope. The eyes look sad and yet happy. “Bilkul. Abhi boht kuch aur dekhna hai idhar.” I assure him. Surely, there much more to see here. “Delhi se ho?” he asks. Are you from Delhi? “Apne doston ko zarur batana. Sab theek hai yahan.” he says with a smile. Do tell your friends about it. It’s all good in Kashmir. “Pakka.” I tell him. Yes, surely. “Khuda ke hawaale!” he signs off. Let it be in the hands of God. It’s another form of ‘Khuda Hafiz’. “Khuda ke hawaale!” I reply. We shake hands, exchanging silent smiles. He walks away to do his duty. I walk away to my room. Khuda ke hawaale, I mutter. Achingly beautiful! This is what I take home. Love and faith. I am no longer a sceptic! Dal Lake as seen from Nishat Bagh. Dal Lake as seen from Boulevard Road.